My cat is alwasy meowing at me. Its gotten a little out of hand, and I was wondering if there were any tips to quiet her down. Its not only for food, but also attention when she meows. I have alwasy given her attention when she meows, which is why I think she keeps talking to me so much. Is there a good way to break this habit? i have been researching and i really love the manx breed. i would like a breed similar but more active. Is there any other breed that is exactly the same personality wise but more active? If i pick an active manx kitten will it stay active its entire life? Affectionate, active, feline (ie: prowls and hunts), docile (doesnt mind being picked up), playful, and tolerant of our dog who is quite old. Should i go with manx breed and just choose an active kitten or should i switch to a different breed? I'm sure a similar discussion has come up many times but here is mine.... I have 2 cats (1 is 15 yrs & the other is 1.5 yr). I have recently found urine on our couch, an upholstered chair, & now our carpet. I have no idea which one of them is doing it. Any tricks as to how to figure this out? BTW, The old one hasn't been to the vet in 13 yrs. as she REALLY dislikes most people & is an overall anxious, stressed out cat. The old one & the young one do not get along. Never have. I keep seeing UTI come up on other discussions. Is it possible that it could be something else or does it look like this is what it is (regardless of which cat is doing it)? Until I figure it out, I need to lock them both in the basement w/ their litter boxes so they don't pee on anything else. Myth about cats having 9 lives? Does anyone know where the myth about cat's having 9 lives comes from? I was thinking that maybe it's because they land on their feet? But thats another questions, do they always land on their feet? Young Cat Cannot Stop Playing! 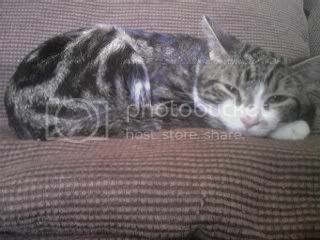 I have a young cat, 1.5yr male, who lives with two 10-yr old female cats (sisters, very close). He gets along very well with one of the girls and they play alot, but he is pouncing on the other one (who has only just tolerated him to this point) constantly for the past month or two. Side notes - he was my mother's cat and she passed away a couple of months ago. He has lived with these other two cats, with no other changes in the household, almost his whole life. Previously he and the grouchy cat (well, she is NOW) ignored each other. I am guessing that he is still missing my mom and taking it out on the grouchy cat. He has energy to spare and even though we do play with him alot, his attention to her seems to be on the increase. No destruction involved, just lots of chasing and pouncing with nails withdrawn. We are considering adopting another young cat, a female, to play with him. Good idea/bad idea? I could use some help. A vet said that our orange kitty might have mild gingivitis, but someone else said that it's totally normal for orange cats to have a little reddish line (maybe pink) in their gums. The vet seemed a little shifty, and all the research I'm finding is about serious cases... if Joey (kitty) has it, it's mild, and I can't find anything about this or about things specific to orange kittys (American short-hair -color orange & white... though mostly orange) Anyone have any ideas on this? The cat is actually my 79 year old mom's - she just got him after her other cat died and now she's worried he's sick and will die also and so I'm trying to calm her while also allowing her to keep this little kitty who is AWESOME! Please help!!!!!!!!! Help With Determining Breed/Colour Pattern Please? Hi everyone! I got my kitten Pandora, and because she was a rescued cat, nothing is known about her. I've been doing some research online, and I think she MAY be a mackeral tabby in colouring and possibly has some Abyssinian in her breed. I was hoping someone can help me with this? I'll post a picture of her that I hope helps! I was told my new cat is a calico. It has stripes though and not spots. It does have white, blackish grey and some brownish orange. Can anyone tell me if it is? I have 2 cats. One is a 4 year old tabby and the other is a 3 year old bi-color. The tabby had to go to the vet with an eye infection. We were gone about an hour, but this is the first hour that the 3 year old has ever spent alone in the house. She's always had the older cat there. When we came back, she immediately began spitting and screaming at the older cat. This has been going on 2 days. TOday I left them alone to go to work and now the 3 year old is screaming and spitting at me. She did this with the older cat once before when we brought in new furniture. What can I do to help her not be so terrified?